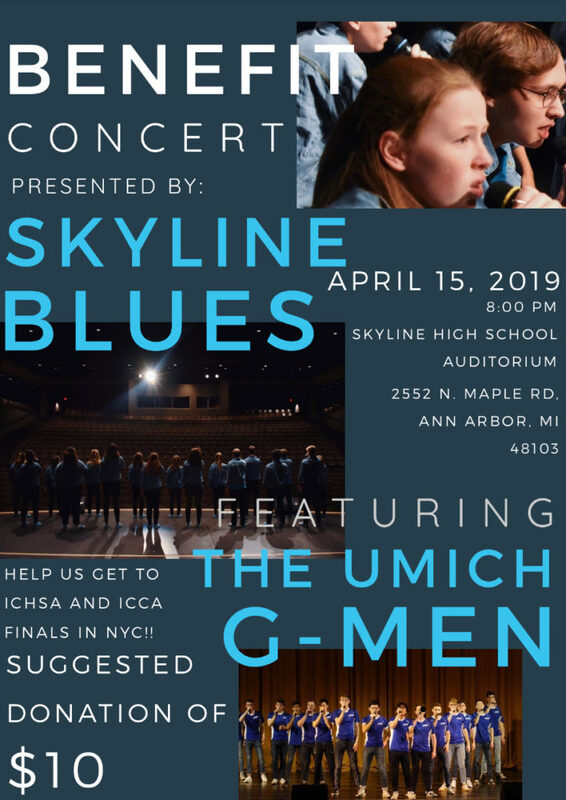 The University of Michigan G-Men and Skyline High School’s Skyline Blues will perform together at an A Cappella Benefit Concert at 8 p.m. on Monday, April 15 at Skyline High School. The suggested donation is $10 at the door. Skyline Blues, under the direction of Lindsay CieChanski and Austin Terris, won the Great Lakes Regional Round of the International Competition of High School A Cappella (ICHSA) last month after winning their quarterfinal round in February. There were 227 high school groups who participated nationwide, in 7 regions. Skyline Blues now advances to the ICHSA National Championship, with the other six regional winners plus one wild card group. The competition takes place at New York City’s Town Hall on Friday, April 26. More good news for Ann Arbor: In the collegiate division, the University of Michigan G-Men followed the same path in their ICCA division, and will represent the Great Lakes Region at the Collegiate National Finals on Saturday, April 27 at NYC’s Playstation Theater. To read more about the send-off benefit concert, click here.